Lao authorities have imposed a curfew in north-central Xaysomboun Province after a spate of violence in which three government soldiers and three civilians were killed, police and other sources said Friday. The authorities blamed the violence last month on bandits, but a source close to the government said an anti-government resistance group was behind the killing of the three soldiers and wounding of several others, a rare development in tightly-ruled Laos where there have been no known armed rebel groups operating in recent years. Police confirmed that a curfew had been imposed and said the situation was under control. “The situation in the province is peaceful," Lieutenant Colonel Bouanphanh, chief of Xaysomboun’s Police Department told RFA on Friday. "We just finished celebrating the Lao National Day this morning." He blamed "bandits" for one of at least six incidents of violence over the last month in the province, saying, "We are investigating." Traditionally celebrated on Dec. 2, Lao National Day was observed on Dec. 11 in Xaysomboun due to security concerns, a source close to the government said. A retired Lao soldier close to a high-ranking officer in the Ministry of National Defense, speaking on condition of anonymity, told RFA's Lao Service that security had been immensely beefed up to prevent further violence. "Now people in the province are under curfew. From 6 p.m. they must be inside their houses," he said. "Government officials [in charge of security at night] have to sleep in bunkers." 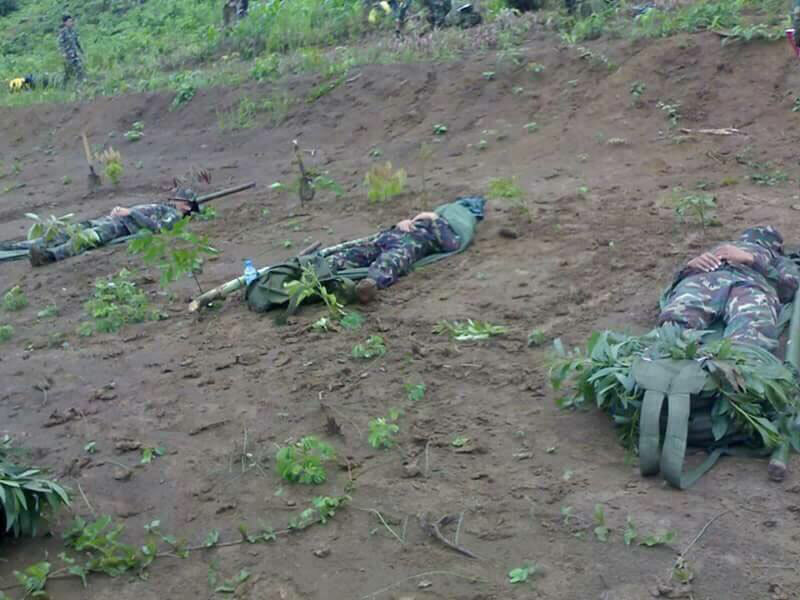 He and another government source, speaking on condition of anonymity, said three soldiers were killed between Nov. 15 and Nov. 18 when they pursued the anti-government resistance group, which sustained unknown casualties. The pursuit occurred after the group was believed to have killed the 10-year-old daughter of a government military officer in a shootout at the officer's residence on Nov. 12, the retired soldier said, without giving any other details of the group. Ten days after the incident, the group was involved in another shootout involving several trucks along a main road, leaving two people dead, he said. There were also shootouts between government forces and the group during the Nov. 23-24 period, and on Nov. 25 and Dec. 2, he said, without giving any details of the incidents or casualties. "Soldiers and people injured are being treated in 103 Military Hospital” in Xaysomboun Province, he said. The Lao national defense committee issued a circular, identified as Notice No. 283, on Nov. 19 warning other provinces to be wary of any further unrest staged by the group. Police chief Bouanphanh acknowledged only the truck-shooting incident, saying two people were killed. He declined to provide details of the military casualties. RFA received a photograph of the three fallen soldiers at the scene from a source close to the government. “The curfew is declared to prohibit people from going out at night for the safety of their properties and lives because the bandits may take advantage to shoot ... and rob people,” he said. But when asked about the exchange of gunfire between anti-government resistance group and Lao soldiers that left three government soldiers dead, Lieutenant colonel Bouanphanh declined to answer. The source close to the government said the province had postponed the Dec. 2 National Day celebrations by more than a week "due to the unrest." Xaysomboun was once a base of thousands of ethnic minority Hmong who fought under CIA advisers during a so-called “secret war” backing the Lao Royal Army against the Pathet Lao communist forces. Reported by Ounkeo Souksavanh for RFA’s Lao Service. Translated by Ounkeo Souksavanh. Written in English by Parameswaran Ponnudurai. So many people that never had put a foot in Laos and speaking from so far away. They just repeat what they have heard. People, this is a special zone. Is the work of PDR officials. Remember this place has few gold mines. Who ever become governor in this county will be rich because the Foreigners. There is no anti-government group. The Hmong always be the bad people in this country. PDR intelligence know very well that is the local government is the problem not the Hmong. I personally don't believe this is anti - Goverment group came and killed them, khon phai nai. But just want to blame somebody else. LPDR will never tell the truth ever since just like sombath's case. I'm blame the western country still handed LPDR a cash & Aid for them to survived day by day, year by year. Why should they fought each other? As an ordinary Laotian, I cannot see any profit except loss.